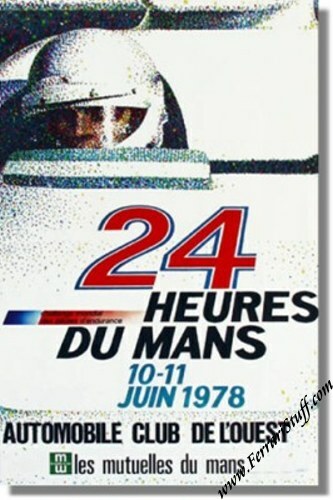 Vintage 1978 24 Heures du Mans Race Poster. June 10 & 11, 1978. The 1978 Le Mans poster is part of the "Early Sponsorship and Advertising" era in Le Mans posters and which lasted from 1975 to 1980. The color illustration is by Lardrot while the production was in the hands of the Le Mans Imprimerie Commerciale. While the designer seeks to emphasize the human aspect of the race by portraying a single driver, the technique used is very special. He imitates silk screen printing in paint. It is an original idea and meticulously executed. Sponsorship is evident (local Le Mans insurance company Les Mutuelles du Mans) and is given the same importance as the date. The race was won by Didier Pironi and Jean-Pierre Jaussaud in their Nr 2 Renault-Alpine A442B "Bubble top" with a total of 369 laps to their name or 5.044 KM. For the full results of this race, please see 24 Heures du Mans results 1978.